eing the most respected organization guided by experienced and knowledgeable professionals, we provide an enormous assortment of Tomato Crates. The offered Tomato Crates are manufactured with the help of quality approved plastic and cutting-edge machines in compliance with set industry standards. Our offered Tomato Crates are made available in different specifications in order to meet vast necessities of our valuable clients. 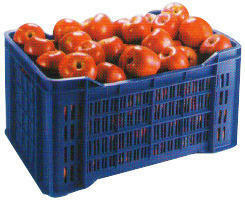 We offer this Tomato Crates at market leading price to our valuable clients. Incorporated in the year 2014, at Ahmedabad (Gujarat, India) we, “Shree Plast” are a noteworthy Manufacturer and Supplier of a wide variety of Plastic Crates, Vegetable Crates, Fruits Crates. Dairy Crates, Multipurpose Crates and Double Wall Crates. By our skillful professionals, these crates are manufactured using modern technology and high quality raw material in adherence to the worldwide quality standards. Also, under the management of our quality inspectors, these products are checked strictly on numerous parameters. These products are very much treasured for their light weight, superb strength, strong design and durability. In order to meet various needs of clients, we offer these crates in diverse specifications like sizes, shapes and colors. Also, these products can be modified also to meet exact need of the clients.